Friends, family and relatives of a 42-year-old architect, who suffered critical injuries in a celebratory firing incident on New Year eve and succumbed Thursday, mourned her death even as police arrested former Bihar MLA Raju Singh, his wife and two others in connection with the incident. The former MLA, who had unsuccessfully contested the 2015 assembly election in Bihar on a BJP ticket, and his driver Hari Singh, had fled Delhi after the incident. They were arrested after being detained on Wednesday from Gorakhpur in Uttar Pradesh. Raju Singh's wife Renu Singh and Raminder Singh, who worked for the leader, were arrested for allegedly destroying evidence, police said. A CCTV footage showing Singh and his driver roaming with weapons, helped police nail them in connection with the case. Renu Singh is a former member of the Bihar legislative council. In an act of benevolence, the family of architect Archana Gupta has donated her kidneys. Friends and others who knew her expressed shock over the "bizarre incident" and said she had celebrated her birthday in the last week of December. Raminder Singh, apart from cleaning the floor, also hid the bullets used, besides trying to threaten the witnesses, said Deputy Commissioner of Police (South) Vijay Kumar. Renu was questioned and initially she did not cooperate but it was found that she was the one who ensured that the bloodstains are cleaned and the rounds are hidden, sources said. They added that she initially kept claiming no bullets were fired but when she was confronted with evidence, she confessed to her role. The police have added IPC Section 302, which pertains to punishment for murder, and punishable with a maximum term of life imprisonment or death sentence, to the FIR. Gupta, a resident of Gautam Nagar in Hauz Khas, had gone to the party along with her husband and daughter. Police said they did not receive any PCR call from the farmhouse and only got to know about it after a call from the hospital authorities. When police reached the farmhouse, they learnt that certain evidence were destroyed, police said, adding the floor was washed and they did not find any empty bullets. Many guests had left the party by then. It was learnt that, two men, Raju Singh and his driver Hari Singh, were missing. During enquiry, it was found that Raju Singh and Hari Singh had opened fire. The accused duo absconded soon after the incident. With the help of technical surveillance, police learnt that the accused was en route to Uttar Pradesh. The UP Police border check-post and Kushi Nagar district police were alerted about the possibility of an Innova car passing through the area, an official said. The UP police intercepted the vehicle and subsequently, Raju Singh and his driver were taken into custody by the Delhi Police team. The accused duo was produced in court on Thursday. Police have taken them in remand for seven days. Police also recovered two used .22 k cartridge from the spot. The pistol used in the incident was seized from the car of Raju Singh. A rifle was also recovered from the vehicle while 800 rifle rounds were recovered from the farm house, police said. However, used rounds have not been recovered yet, they added. During questioning, the former MLA's wife was evasive, sources said. 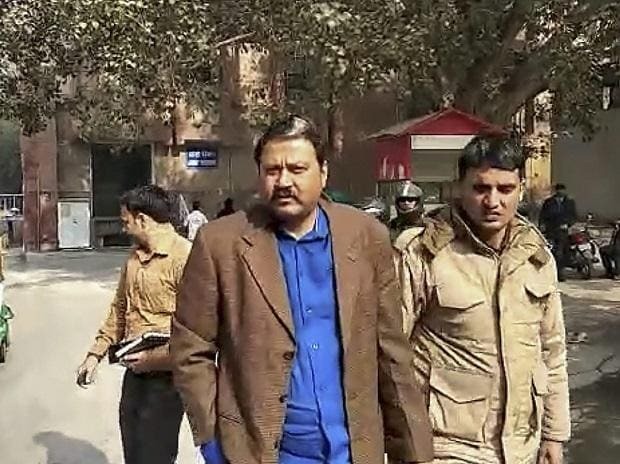 After their arrest, Raju Singh and Hari Singh were taken to AIIMS for medical examination before their production in the court, Vijay Kumar, Deputy Commissioner of Police (South), said. Forensic test was also done on the accused to ascertain who fired the shots, police said. The mortuary is also situated in the same building. Adequate security arrangements were made at the hospital when the accused were taken there. Reports claimed that the accused met the victim's family members. The police, however, said they were not allowed to meet the victim's family at the hospital. The woman was cremated after the post-mortem. In his complaint to police, Gupta's husband had said that they were at the farm house on Monday night to celebrate the New Year along with friends and around midnight, two-three rounds were fired by Raju Singh. Immediately, he noticed his wife falling down and bleeding. The police were informed and a medicolegal case was registered, a hospital spokesperson said. The farm house is owned by Raju Singh's mother where he lives with his family. Singh's two brothers also live with their families in the farm house, police added.